From the professional to personal front, iPad stashes all the crucial information you want. But, if it gets halted due to locked screen, it may pose a full stop on your existing piece of work. How then can you unlock a screen locked iPad? Well, we've come up with this post that will certainly help you to unlock and Apple iPad with ease. Without waiting any longer, let's now understand how to unlock a screen locked iPad. What May Cause iPad Locked/Disabled? The disabled screen is the most horrifying of all. Not all does it infers in the working of your iPad and disables it, you cannot even unlock it. The root cause of this can be repetitive wrong attempts undertaken by your end. Which may have been done out of haste or somebody might have tried using your device. The best method of unlocking your locked iPad is via Tenorshare 4uKey! One of the secured ways of ruling out any rigid security locks on your device and that too, in an effortless manner. 4uKey is designed to work fantastically in the latest iPad and iPhone models and drives out security concerns with ease. Moreover, it can swiftly work down in a Windows computer too. Here is the comprehensive guide on how to unlock a locked iPad via 4uKey. Step 1 Download Tenorshare's 4uKey on your system and connect your iPad. Launch the Tenorshare 4uKey. The program will detect your iPad and showcase it over the screen. Then, tap on 'Start' button. Step 2 After that, you will see a screen for downloading the latest compatible firmware package for your iDevice. You can opt for saving the package to your desired location on your PC and then hit 'Download'. Step 3 Now the final step for unlocking your locked iPad is by hitting the 'Start Unlock' button succeeded by the required actions. One of the effective ways of unlocking your locked iPad is via iTunes. But, you must comply to the condition that your device should be synced with iTunes already. If it is not, then this method won't be able to bring you any good. Let's understand how to unlock a locked ipad using this method. 1. Establish a link of your iPad to your working PC. Now, opt for 'Device' icon from the upper left corner and tap on 'Summary'. Thereafter, tap on 'Restore iPad' option for unlocking a locked iPad. If your iPad is not synced with iTunes then you can unlock your locked iPad in a Recovery Mode. That can be processed from the following steps. 1. Press 'Home' and 'Power' button simultaneously until 'Connect to iTunes' screen appears. Now, you need to simply plug your iPad into your PC. 2. iTunes will then throw a message of "iTunes has detected iPad in a Recovery Mode", click on 'Ok' followed by 'Restore iPad'. In case you've enabled iCloud account's 'Find My iPhone' service over your iPad, then you can easily make use of this method to unlock your device remotely. Gain access to iCloud's website and sign-in to your iCloud account using your credentials. After getting signed in, tap on 'Find My iPhone' icon from the program. Now, locate for 'All Devices' tab followed by selecting your iPad featured in the drop down menu. Lastly, click on 'Erase iPad' button > 'Erase' button. Tada, this way you can unlock your iPad with the locked screen. Wondering why Tenorshare 4uKey is the best? Well, the below salient features will reason out why. The ultimate feature of Tenorshare 4uKey is that one can effectively unlock and upgrade the iOS firmware version to the latest one in just a matter of a single click. In other words, 4uKey swiftly unlocks iPad even when the screen is locked or your touch/keys are not working. 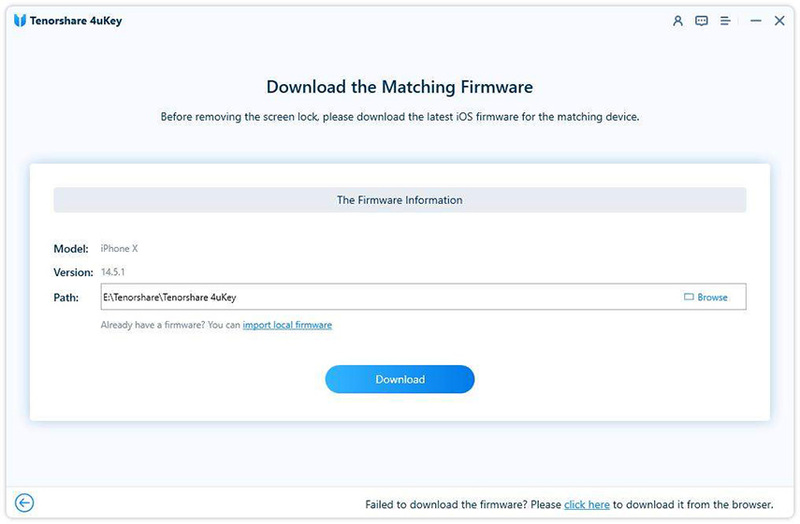 In addition, firmware gets automatically upgraded to the latest version. With 4uKey's supreme features, be assured of getting not device brick screen on your iPad. You can undo the lock on your iPad without having to incur any hassles or tensions of getting locked out from your device. In just a couple of moments, you can unlock your locked iPad as Tenorshare 4uKey processes the procedure really fast. We've seen a couple of methods on how to unlock your iPad on the locked screen. While there are organic means of unlocking your device, but to implement unlocking in an effective way, 4uKey stands as a viable option for. Besides unlocking, 4uKey also surpasses the firm passcodes, Touch ID or Face ID remotely.